Rafael Nadal Parera (Catalan: [rəf(ə)ˈɛl nəˈðal pəˈɾeɾə], Spanish: [rafaˈel naˈðal paˈɾeɾa]; born 3 June 1986) is a Spanish professional tennis player, currently ranked world No. 2 in men's singles tennis by the Association of Tennis Professionals (ATP). In 2002, aged 16, Nadal reached the semifinals of the Boys' Singles tournament at Wimbledon, in his first ITF junior event. In the same year, he helped Spain defeat the US in the final of the Junior Davis Cup in his second, and final, appearance on the ITF junior circuit. Nadal's Challenger level record in 2002 was 4–2 in singles with no titles. He did not participate in any doubles Challengers events. Nadal finished the year with a Futures record of 40–9 in singles and 10–9 in doubles. He won 6 singles tournaments at this level, including 5 on clay and 1 on hard courts. He did not reach any doubles finals. Nadal also entered the clay-court Mallorca Open, part of the ATP International Series, at the end of April as a wildcard, where he participated in both singles and doubles. In singles, Nadal won his first ever ATP match, defeating Ramon Delgado in the Round of 32. He then was defeated in the Round of 16 by Olivier Rochus. In doubles, Nadal and his partner, Bartolome Salva-Vidal, were defeated in the first round by David Adams and Simon Aspelin. In 2003, Nadal won two Challenger titles and finished the year ranked No. 49. He won the ATP Newcomer of the Year Award. In his Wimbledon debut in 2003, he became the youngest man to reach the third round since Boris Becker in 1984. After Wimbledon Nadal participated at Bastad, where he lost to Nicolas Lapentti in the quarterfinals, and at Stuttgart, where he lost to Fernando Gonzalez in the Round of 32. Finally, at Umag, he lost to Carlos Moya in the semifinals. After playing two more Challenger level events, the last Challenger tournaments of his career, Nadal finished his 2003 campaign with three first round losses in ATP events. 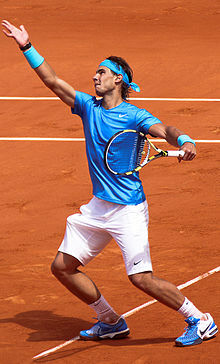 Nadal also competed in seven doubles tournaments in 2003, and won his first ATP title (doubles or singles) at the clay-court Croatia Open in Umag, where he partnered with Álex López Morón to defeat Todd Perry and Thomas Shimada in straight sets in the final. By beating Lleyton Hewitt in the third round of French Open, Nadal set a record of 31 consecutive wins at the French Open, beating the previous record of 28 by Björn Borg. This run came to an end on 31 May 2009, when Nadal lost to eventual runner-up, Robin Söderling in the 4th round. This was Nadal's first and, until 2015, only loss at the French Open. After his surprise defeat in France, Nadal withdrew from the AEGON Championships. It was confirmed that he was suffering from tendinitis in both of his knees. On 19 June, Nadal withdrew from the 2009 Wimbledon Championships, citing his recurring knee injury. Roger Federer went on to win the title, and Nadal consequently dropped back to No. 2 on 6 July 2009. Entering the French Open, many were expecting another Nadal-Federer final. However, Robin Söderling defeated Federer in the quarterfinals. Nadal advanced to the final and defeated Söderling in straight sets. The victory marked the second time that Nadal had won the French Open without dropping a set. In June, Nadal entered the AEGON Championships, which he had won in 2008. He was defeated by compatriot Feliciano López in the quarterfinals. At the Wimbledon Championships, he won his first two matches in straight sets. In the third round he needed five sets to defeat Philipp Petzschner. During the match Nadal was warned twice for allegedly receiving coaching from his coach and uncle, Toni Nadal, resulting in a $2,000 fine by Wimbledon officials. He then defeated Andy Murray in the semifinals and Tomáš Berdych in the final to win his second Wimbledon title and his eighth career major title just past the age of 24. At the 2012 French Open, Nadal dropped only 30 games against his first five opponents. In the semifinals he dismantled Ferrer to set up another final against Novak Djokovic. This marked the first time two opposing players faced each other in four consecutive Grand Slam finals. Nadal won the first two sets before Djokovic claimed the third. Play was suspended in the fourth set due to rain. 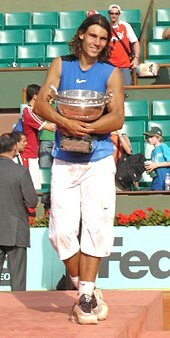 When the match resumed the following day, Nadal won when Djokovic double faulted on match point, sealing a record 7th French Open title for Nadal. By winning his seventh title at Stade Roland Garros, Nadal surpassed Borg's overall titles record to become the most successful male player in French Open history. Nadal only lost a total of three sets in the 2012 clay court season. Nadal began his clay court season with a quarterfinal loss to David Ferrer in the Monte-Carlo Masters. He was stunned by Nicolas Almagro in the quarterfinals of the Barcelona Open. Nadal then won his 27th masters title at the Madrid Open after Kei Nishikori retired in the third set of the final. On 8 June 2014, Nadal defeated Novak Djokovic in the Men's Singles French Open final to win his 9th French Open title and a 5th straight win. Nadal equaled Pete Sampras' total of 14 Grand Slam wins. Nadal then lost in the second round of the Halle Open to Dustin Brown the following week. Following Federer's withdrawal due to injury, Nadal was named the fourth seed at the French Open. On 26 May, he became the eighth male player in tennis history to record 200 Grand Slam match wins, as he defeated Facundo Bagnis in straight sets in the second round of the Slam. Following the victory, however, Nadal had to withdraw from competition owing to a left wrist injury initially suffered during the Madrid Open, handing Marcel Granollers a walk-over into the fourth round. On 9 June, Nadal announced that the same wrist injury that forced him to withdraw from the French Open needed more time to heal, and that he would not play at the 2016 Wimbledon Championships. At the Rio 2016 Olympics, Nadal achieved 800 career wins with his quarterfinal victory over the Brazilian Thomaz Bellucci. Partnering Marc López, he won the gold medal in men's doubles event for Spain by defeating Romania's Florin Mergea and Horia Tecau in the finals. This made Nadal the second man in the open era to have won gold medals in both singles and doubles. 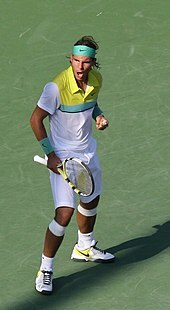 Nadal also advanced to the bronze medal match in the men's singles but was defeated by Kei Nishikori. Nadal became the first player to hold, lose and regain the year-end No. 1 on three occasions (no one else had done it twice). At the Rome Masters, Nadal captured his 8th title in the Italian capital as well as his 78th career title, defeating Alexander Zverev in three sets, thus overtaking John McEnroe in the fourth place on the list of most titles won in the Open Era. It was Nadal's 32nd Masters title – most of any player in the Open Era. With his victory in Rome, Nadal also regained the no. 1 spot from Federer. Also In the semifinals, he faced his arch-rival Novak Djokovic for the record 51st time, beating him in two sets after a tight first set tiebreak. Nadal was the top seed during his title defense at the US Open. He first faced David Ferrer in Ferrer's last Grand Slam match, who retired due to injury during the second set. He then defeated Vasek Pospisil in the second round, Karen Khachanov in four close sets in the third, and Nikoloz Basilashvili in the fourth. In the quarterfinals, he faced ninth seed Dominic Thiem in their first ever match on a surface other than clay. Nadal lost the first set 0–6, but took control in the second and third, winning both after breaking Thiem as he attempted to serve for the third set. Nadal came back from a break down to force a fourth set tiebreaker, which Thiem narrowly won. In the fifth set, Nadal was unable to convert three break points at 5–5 which would have allowed him to serve for the match. He was able to win the match 7–5 in the tiebreaker at 2:04 am local time, after 4 hours and 49 minutes. In his semi-final matchup against Juan Martin del Potro, Nadal retired after losing the second set 6–2 due to knee pain. On 31 October, he announced his withdrawal from the Paris Masters due to an abdominal injury and as a result Novak Djokovic replaced him as World #1. Nadal was due to start his season at the 2019 Brisbane International, but withdrew shortly before his first match due to an injury. He was seeded second at the 2019 Australian Open, and recorded straight-sets wins against James Duckworth, Matthew Ebden, Alex de Minaur, Tomáš Berdych, first-time quarterfinalist Frances Tiafoe and first-time semifinalist Stefanos Tsitsipas to reach his fifth Australian Open final. This was the first time that Nadal had advanced to an Australian Open final without losing a set; he had also lost only two service games during this run, both in his first-round match against Duckworth. Nadal lost the final in straight sets to Novak Djokovic, winning only eight games for the match, and marking Nadal's first straight-sets loss in a Grand Slam final. Nadal next played at the 2019 Mexico Open where he reached the second round, losing to Nick Kyrgios in three sets despite having three match points in the third set. After withdrawing from both Indian Wells and Miami due to a right hip injury, Nadal then played at the 2019 Monte Carlo Masters and reached the semifinal, losing to eventual champion Fabio Fognini in straight sets. Novak Djokovic and Nadal have met 53 times (more than any other pair in the Open Era) and Nadal trails at 25–28. Nadal leads on clay 16–7, while Djokovic leads on hard courts 19–7, and they are tied on grass 2–2. In 2009, this rivalry was listed as the third greatest of the previous 10 years by ATPworldtour.com. Djokovic is one of only two players to have at least ten match wins against Nadal (the other being Federer) and the only person to defeat Nadal seven consecutive times, and two times consecutively on clay. The two earlier shared the record for the longest match played in a best of three sets (4 hours and 3 minutes) at the 2009 Mutua Madrid Open semifinals until the match between Roger Federer and Juan Martín del Potro in the London 2012 Olympics Semifinal, which lasted 4 hours and 26 minutes. They have also played in a record 12 Masters Series finals. Nadal defeated Djokovic in the 2014 French Open final. Since the 2014 French Open Final, Djokovic has won seven consecutive meetings including a win in straight sets in the quarterfinals of the 2015 French Open which ended Nadal's 39-match win streak at Stade Roland Garros and an opportunity for a sixth consecutive title, with Djokovic becoming only the second player after Robin Söderling to defeat Nadal at the event. Nadal easily defeated Djokovic in the 2017 Madrid Open semifinals (6–2, 6–4), his first victory against the Serb since the 2014 French Open. When they next met Nadal beat Djokovic again, this time on clay in the 2018 Rome semifinals. They then met in the 2018 Wimbledon semifinals, where Djokovic finally emerged victorious after a battle lasting over five hours that was spread over two days and went to 10–8 in the fifth set. Their most recent encounter was the 2019 Australian Open final, which Djokovic won in straight sets, marking Nadal's first straight-sets loss in a Grand Slam final. Nadal and Juan Martin del Potro have met 17 times, with Nadal leading 11–6 (64.71%). Outside the Big-4 and David Ferrer, no active player has more wins against Nadal than Del Potro. The two have met in many prestigious tournaments, including at 3 of the 4 grand slams. Nadal won their first four meetings between 2007-09, however Del Potro went on to win the next three, including a straight sets victory at the 2009 US Open SF (he later went on to win the tournament after defeating Roger Federer in the final. Their next major meeting came during the 2011 Davis Cup final. Nadal went on to beat Del Potro in 4 sets to claim the Davis Cup for Spain, their fourth since 2004. Nadal in 2013 also denied Del Potro his first Masters 1000 title, with a victory in 3 sets at the 2013 Indian Wells Masters. However, Del Potro got his revenge, and had one of his most important victories against Nadal in the SF of the 2016 Summer Olympics, beating him in 3 close sets (culminating with a tie break). Del Potro went on to claim the silver medal. After a long span of injuries with both players, the pair met in a Grand Slam for the first time since the R16 at Wimbledon in 2011 at the 2017 US Open. Del Potro, facing Nadal after a victory in 4 sets against Federer, made it to the SF of a Grand Slam for the first time since 2013. However, the Spaniard got the better of him in that encounter, beating Del Potro in 4 sets. The pair then met in 3 of the 4 grand slam events in 2018, including a memorable match at the 2018 Wimbledon Championships SF. The match went on for close to 5 hours, with Nadal coming out on top, 7–5 6–7 4–6 6–4 6–4. The pair had another meeting at the 2018 US Open, during which Nadal was forced to retire against Del Potro in the SF. Del Potro then went on to his first grand slam final since his victory in the 2009 US Open. He ended up losing in the final in straight sets to Novak Djokovic. Nadal is a clay court specialist in the sense that he has been extremely successful on that surface. He has won 11 times at the French Open, Monte Carlo, and Barcelona, and seven at Rome. However, Nadal has shed that label owing to his success on other surfaces, including holding simultaneous Grand Slam tournament titles on grass, hard courts, and clay on two separate occasions, winning eight Masters series titles on hardcourt, and winning the Olympic gold medal on hardcourt. Rafael Nadal opened his tennis academy centre to Majorca flood victims in October 2018. By that time he was recovering at home in Majorca, shortly after having to leave the US Open due to injury and one day after the flood he worked personally with some friends to help the victims. Later, Nadal donated €1 million for rebuilding Sant Llorenç des Cardassar, the most affected town by the floods in the island. Nadal also organized other charitable activities to help repair the damage of the disaster, such as the Olazábal & Nadal charity golf tournament  and a charity tennis match in which he was going to participate and that had to be suspended because he had to be operated from an ankle injury. In addition to tennis and football, Nadal enjoys playing golf and poker. In April 2014 he played the world's No. 1 female poker player, Vanessa Selbst, in a poker game in Monaco. Nadal's autobiography, Rafa (Hyperion, 2012, ISBN 1-4013-1092-3), written with assistance from John Carlin, was published in August 2011. Nadal has been dating long-time girlfriend María Francisca (Xisca) Perelló since 2005. In January 2019, it was announced that the couple are set to marry. ^ The finals Nadal reached without losing a set were the 2007, 2008, 2010, 2012 & 2017 French Opens, the 2010 US Open, and the 2019 Australian Open. ^ The term "combined Championship Masters Series" encompasses the Grand Prix Championship Series (1970–1989), ATP Masters Series (1990–2008) and ATP Tour Masters 1000 (2009–present). ^ "ATP World Tour – rafael-nadal profile". ATP World Tour. Retrieved 1 April 2019. ^ a b "Rankings: Singles". ATP World Tour. Retrieved 21 August 2017. ^ "Rafael Nadal Wins Second Match in Davis Cup, Helps Spain Dominate Belgium". Fox News Channel. Associated Press. 6 March 2011. Archived from the original on 26 July 2011. Retrieved 6 March 2011. ^ "Nadal dominant in winning 10th French Open title". ATP. Retrieved 11 June 2017. ^ "Nadal Clinches Year-End No. 1 Emirates ATP Ranking For Fourth Time – ATP World Tour – Tennis". ^ "50 And Counting... – ATP World Tour – Tennis". ^ "Rafa Reigns In Rome, Returns To No. 1 – ATP World Tour – Tennis". 20 May 2018. ^ "Nadal humbled in worst slam final". SBS News. 27 January 2019. Retrieved 28 January 2019. ^ "Kyrgios saves three match points, beats Nadal in Acapulco". Reuters. Reuters. Retrieved 6 March 2019. ^ "Rafael Nadal Withdraws From Indian Wells & Miami". ATP Tour. ATP Tour. Retrieved 24 April 2019. ^ "Monte Carlo Masters: Rafael Nadal loses to Fabio Fognini in semi-finals". BBC Sport. BBC Sport. Retrieved 24 April 2019. ^ "Francisco Roig: "In Some Ways, This Is Our Biggest Goal" – ATP World Tour – Tennis". atpworldtour.com. Retrieved 10 September 2017. ^ "Nadal Doesn't Use an APDC". Talk Tennis. 1 September 2007. Archived from the original on 26 August 2009. Retrieved 30 January 2009. ^ "Rafael Nadal opens his tennis academy centre to Majorca flood victims". 11 October 2018. Retrieved 24 January 2019. ^ "Nadal joins Majorca clean-up effort". BBC News. Retrieved 25 January 2019. ^ Bohórquez, Lucía (20 December 2018). "Tennis star Rafael Nadal donates €1m to victims of Mallorca flash floods". El País. ISSN 1134-6582. Retrieved 25 January 2019. ^ "Rafa Nadal donates €1 million for Rebuilding Sant Llorenç des Cardassar". Tennis World USA. Retrieved 24 January 2019. ^ Sobot, Rita (20 December 2018). "Rafael Nadal donates â‚¬1million to Mallorca flood victims". mirror. Retrieved 24 January 2019. ^ "PHOTOS/VIDEO: Olazábal & Nadal Invitational 2018 charity golf tournament – 15 Декабря 2018 – RAFA NADAL – KING OF TENNIS". rafanadal-kingoftennis.ru. Retrieved 25 January 2019. ^ "Nadal donates one million to Sant LlorenÃ§". Majorca Daily Bulletin. 20 December 2018. Retrieved 25 January 2019. ^ "Nadal donates $1.1 million to victims of flash floods in Spain's Mallorca". www.efe.com. Retrieved 25 January 2019. ^ "Rafael Nadal: Charity Work & Causes". Look to the Stars. Retrieved 24 January 2019. ^ "Rafael Nadal engaged to girlfriend of 14 years Mery Perello". cnn.com. 31 January 2019. Retrieved 31 January 2019.